Total retail sales increased modestly last Christmas season (4.0% higher in QIV than in QIV 2011) while e-commerce (Internet) retail sales increased 15.6% during the same time period. E-commerce sales are still a relatively small percentage of total retail sales but some of that is a function of the percentage of consumer goods that will never be sold over the Internet (don’t look for free shipping and returns on gasoline or boneless chicken soon). 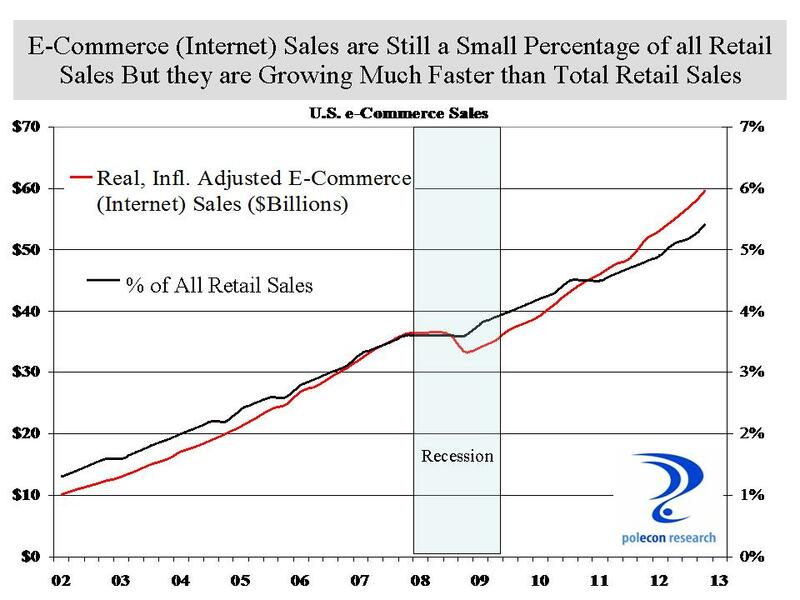 E-commerce now accounts for about 5.4% of retail sales, a new record. E-commerce sales are an interesting issue for a lot of reasons. It portends heavyweight policy battles over the taxation of e-commerce and brick and mortar sales as well as policy debates over taxing the source or destination of sales. It also has longer-term implications for the demand for commercial real-estate, the usage, mix and look of downtowns, malls, and probably the nature of a good percentage of our socialization and interactions, but that won’t be apparent for some time. For someone who doesn’t like to shop (and even for those who do), e-commerce essentially reduces the cost (time and travel etc.) of shopping and comparison shopping to near zero, so it has the potential to increase the time available for other activities. That could be a good thing, but if it reduces the time we spend walking through our downtown or otherwise interacting with our communities so that we can get to know a thousand more people infinitely less well on-line, I ‘m not sure it makes that much of a contribution. To the upside, e-commerce has given a lot of us yet another reason not to try-on the clothes or shoes we buy. Are consumers especially motivated to comparison and price shop on-line during recessions or in weaker economic times? Does a weaker economy convert more sales to e-commerce? I look at state level data and use quarterly industry earnings data to estimate state-level retail sales in some states and noted that NH’s retail sales fell less than neighboring states during the recession. A result I attribute, in part, to the 5% or greater savings due to NH’s lack of a retail sales tax, that consumers may be even more motivated to realize during a recession. Can the most attractive elements of e-commerce be combined with brick and mortar retailing to “double the pleasure”. Which retailer or type is most likely to find the formula? How much different are the demographics of on-line buyers than are those of traditional retailers? I assume for the most part e-commerce buyers have somewhat higher incomes and are likely to be younger. If income were the primary difference I would expect that e-commerce sales would probably decline less than total retail sales. If age is a significant contributor, how much will demographic trends matter? Its been a while since I’ve been in a mall, have teenagers forsaken them for on-line social gatherings? How are sales trends affected by differences in the percentage mix of products sold on-line and at bricks and mortar stores. As an example, furniture stores and home furnishings sales were pummeled during housing market drop and recession and I have to think those items are less representative of e-commerce sales. Will shopping downtown now mean going to an internet cafe? Is there an e-commerce substitute for “recreational shoppers”? These are just a few of the questions I will never have time to investigate. Recent trends are probably a combination of these factors and more and no doubt someone who looks and writes about these trends more thoroughly has answers where I have only questions. The comment lines are now open. This entry was posted on March 21, 2013 at 1:34 pm and is filed under consumers, consumption. You can subscribe via RSS 2.0 feed to this post's comments.